Part of the reason Jonny Quest makes you feel like you're "really there" when they visit all those exotic locales are those vivid backgrounds that set the stage for the episode. A big part of those backgrounds is the large variety of wild animals that are seen living in their natural habitats. Sometimes, they play a significant part in the story, sometimes they're just background, but always they help bring across that "sense of wonder" of being some place new and exciting. This list celebrates those animals that have appeared in Jonny Quest. Thanks to jolicoeur@sympatico.com for suggesting this list! polar bear Arctic Splashdown A mother and her two cubs; Bandit thought the two youngsters (shown here) might make good playmates! seal Arctic Splashdown A mother and baby -- Jonny and Hadji tried to catch the baby (seen in this image), but the mother helped Jonny see that wasn't such a good idea by balancing him on her nose, then tossing him into a snowbank. killer whale Arctic Splashdown This "wolf of the sea" actually saved Dr. Quest's life when it breached under the walkway to the missile, wrecking the structure, but throwing him safely out of the danger zone seconds before the rocket exploded. walrus Arctic Splashdown An arctic "road hog"
camel The Curse of Anubis Jonny was very excited about riding these "ships of the desert". When he tried riding one standing up, Bandit gave chase, and ....well, Hadji's quote says it all: "That was a good trick, Jonny! First no hands, and then no camel!" Later, everyone got a chance to ride one a bit more sedately, but even then the rolling gait made Bandit "sea-sick". adders The Curse of Anubis Deadly poisonous snakes; released by Dr. Kareem as he trapped Dr. Quest and Race in the catacombs. Hadji later saved the day by using music to get them to peacefully leave. scorpion The Curse of Anubis This denizen of the desert was found in the Quest's hotel room (discovered by the ever-vigilent Bandit, of course); Race used an old rhino-hide whip to kill it before it could harm anyone. jackal The Curse of Anubis The cries of this desert scavanger were heard in the night around the campfire, and we only got a few brief glimpses of the animal itself. crab Pursuit of the Po-Ho Bandit's about to learn a painful lesson from this native of Palm Key's beaches. black panther Pursuit of the Po-Ho This jungle cat was seen being frightened by Bandit's amplified barking. crocodile Pursuit of the Po-Ho Another animal that jumped into hiding after hearing Bandit's loud barks. armadillo Pursuit of the Po-Ho A private moving bed for Bandit? Not, quite, as this creature ran and hid under a porch, dislodging poor Bandit rather abruptly! monkey Pursuit of the Po-Ho This small mammal seemed a bit disturbed upon seeing the Po-Ho rowing down the river with Dr. Hartman as their captive. parrot The Riddle of the Gold A semi-domesticated bird in the Maharaja's palace. elephant The Riddle of the Gold A mother and child, relaxing in a river. toucan Treasure of the Temple The Central American jungle's "welcome wagon", it saved Bandit from being bitten by a poisonous lizard. It could also mimic human speech in a limited fashion. ant Treasure of the Temple Bandit was intrigued by these small insects. anteater Treasure of the Temple This large jungle denizen interrupted Bandit's studies of the ant world by removing the object of study with its long tongue. Gila Monster Treasure of the Temple A deadly poisonous reptile. vulture Treasure of the Temple Carrion-eaters mainly, these large birds were waiting for their next meal (a native staked to the ground) but the Quests rescued the man instead. vampire bat Treasure of the Temple A flock of these nocturnal flying mammals spread into the night; one attacked Race as he left the safety of the campfire. crocodile Treasure of the Temple Deadly reptiles lurking along the underground stream, these creatures showed willingness to attack almost anything that moved, from a native, to Race, to the bad guys. giant cave spider Treasure of the Temple After Race got caught in its web, Dr. Quest had to shoot it to save his friend. snake Treasure of the Temple A brightly-colored reptile of the jungle. cobra Calcutta Adventure Hadji's pipe playing was simply charming to this poisonous snake. mongoose Calcutta Adventure This little mammal showed off the speed and agility that help it kill snakes, leaving Bandit in a dizzy spin. jackrabbit The Robot Spy A desert native, this large rodent left Bandit breathing dust. centipede Double Danger This large multi-segmented insect took Bandit for a fast (but very short) ride. serow Double Danger A rare animal, part goat, part antelope, very shy. lizard Double Danger A large lizard. leopard Double Danger This big cat nearly attacked Jonny and Hadji, but a timely shot from Jade's pistol scared it off into the jungle. King cobra Double Danger One of the deadly residents of the Thai jungle. elephants Double Danger Hadji directed these rampaging beasts into the camp in time to thwart Zin's plans. condor Shadow of the Condor The kings of the Andean skies. owl Shadow of the Condor Normally a predator itself, this poor bird became the prey for a condor. some colorful fish Skull and Double-Crossbones The tropical waters teem with life! large fish Skull and Double-Crossbones Just swimming along, minding it's own business, when a dog (of all things!) swims into its mouth! But a quick tug on the rope pulled Bandit to safety. very large fish Skull and Double-Crossbones Estimated at over 300 pounds, this gigantic denizen of the deep patiently allowed Dr. Quest to record its heartbeat, and posed quietly for a photograph. a small fish Skull and Double-Crossbones This little guy wanted his picture taken, too -- he swam right in front of Dr. Quest's camera as the good doctor was trying to take a snapshot of the huge fish (see above). shark Skull and Double-Crossbones A large species, which Dr. Quest called "the grand-daddy of all sharks" - fortunately, it was merely curious, and not in a biting mood. sea horse Skull and Double-Crossbones Another of the myriad dwellers of the tropical seas. "porpoise" aka bottlenose dolphin Skull and Double-Crossbones This friendly "clown of the sea" helped Bandit swim fast and reach help when needed. sea turtles Skull and Double-Crossbones These gentle creatures let Jonny and Hadji do some "surfing". squid Skull and Double-Crossbones Jonny saw this little one near the shipwreck where he found the gold. Portugeuse Man O' War Skull and Double-Crossbones Bandit swims safely by this large jellyfish. octopus The Dreadful Doll This shy creature made Hadji laugh when it "inked" Jonny as it made its escape. "porpoise" aka bottlenose dolphin The Dreadful Doll A friendly mammal that chattered into Dr. Quest's hydrophones, and later gave Jonny and Hadji a ride. "kissing fish" The Dreadful Doll Was Dr. Quest really alone down there in the diving bell? "large-mouthed" fish The Dreadful Doll This appears to be a type of "grouper" which can grow to huge sizes and has been known to be aggressive. Thanks to Jonathan Gaffin and Scott Pearce who both sent in this identification. John Boyd reports that the rendering appears to be an almost exact match to the Black Grouper as found in a book he has called "Reef Fish Identification"; the book is by Paul Humann. But John also cautions:"Of course, how reliable a source is this book anyway? It never mentions the Jonnyquestitis, the Indian Turbanfish, nor the Dogfish!" monkey A Small Matter of Pygmies The jungles are full of life, too -- here's a small monkey that watches events from the safety of the treetops. bird A Small Matter of Pygmies Another colorful jungle bird. black panther A Small Matter of Pygmies The panther almost made short work of a pygmy, but Race saved the man by shooting this big cat. Tobura lizard Dragons of Ashida From this small nearly extinct lizard, a mighty dragon was made! Ashida dragon Dragons of Ashida Dr. Ashida's gigantic creations (some over 14 feet long); very similar to the komodo dragon in appearance, although their source was the much smaller Tobura lizard (see above entry). pteranodon Turu the Terrible A prehistoric flying reptile, it somehow survived into the modern age. black panther Turu the Terrible A feared jungle predator, it lived in fear of Turu. crocodile Turu the Terrible The cry of Turu could send this jungle denizen into the river for cover. But in the river, they were fierce, aggressive predators, even attacking boats! It took a lot of firepower to drive them back. river fish Turu the Terrible Poor Bandit; another painful experience! tarantula The Fraudulent Volcano This deadly arachnid was set loose in the Quest's sleeping quarters in an attempt to stop the investigation of the volcano. Zin's bird The Fraudulent Volcano Dr. Zin apparently kept this bird around for company; it appeared to be some sort of raven. Can anyone identify it more accurately? skunk Werewolf of the Timberland This woodland creature leads Bandit on a merry chase, but with undesirable results for the pup. great horned owl Werewolf of the Timberland Part of White Feather's communication system. tropical fish Pirates from Below In the tropical waters off Palm Key, the fish are abundant. seahorse Pirates from Below As Jonny remarked, its scientific name, Lopho branchiate, is bigger than it is. giant squid Pirates from Below This surprise visitor gave Dr. Quest the opportunity to try out the underwater prober's arms. apes Attack of the Tree People A friendly folk, unless you're on the side of the bad guys! turtles Attack of the Tree People These small reptiles thought Bandit was their mother when they first came out of their nest, but they soon headed for their true home in the sea. parrot Attack of the Tree People This brightly-colored bird surprised Jonny and Hadji as they explored the jungle. gorilla The Devil's Tower The baby wanted to play with Bandit, but the mother had other opinions about the appropriateness of such behavior. stork The 'Q' Missile Mystery The swamps of Quetong are home to this large bird. crocodile The 'Q' Missile Mystery And, of course, what tropical swamp would be complete without some crocodiles? fish The 'Q' Missile Mystery These fish, caught for years by local fisherman, were recently tainted with the by-products of missile fuel production, making people sick. seal The House of Seven Gargoyles An aquatic resident of Norway's fjords. sparrow The House of Seven Gargoyles This small bird annoyed the gargoyle enough that he shooed it away -- and Jonny saw it. crab Terror Island One of the common small animals that Chu Sing Ling turned into giant monsters. spider Terror Island Normally no bigger than the size of a human thumb, this common spider was terrifying when enlarged to monstrous size. lizard Terror Island This normally inoffensive reptile ended up being the downfall of Chu Sing Ling and his horrible experiments. yeti Monster in the Monastery Some bad guys pretended to be this beast to terrorize the villagers, until a real yeti showed up and "played pretty rough". deep-sea creature (unnamed) The Sea Haunt A cross between a hippocampus and a manticore, according to Dr. Quest, this creature of the sea's depths abhored light. The episode with the most variety of animals -- "Skull and Double Crossbones" with ten (10). "Treasure of the Temple" was next with nine (9); "Double Danger" was third with seven (7). 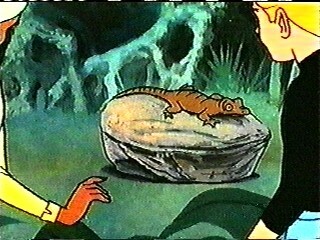 The most commonly-seen wild animal -- the crocodile, seen in four (4) episodes. Next were the black panther and monkey, each seen in three (3) episodes.